These days, there seem to be robots for almost everything. So why not outsource a robot to a difficult, complicated, and very nuanced task. That's right, you've conscripted your favorite robot friend, Chip, to simulate going on a date with you! There's a saying that all's fair in love and war, but what about cheating? Oh no, not the cheating on your lover kind, but cheating the system! After all, in Practice Run, your sole objective should you choose to accept it, is the accumulation of Romance Points. Perform well, and you will score points! Perform badly, however (like, not taking a shower in three days), and watch your score take a tumble. If this sounds easy like a game show, well, you're going to have your plate full. With a branching story and a total of seven (or ten, depending on how you count) total endings, there's lots of replay value if you want to see how things would have turned out with a different set of actions. Practice Run draws parallels between its colorful, splashy cyberpunk world of the future and the mundane of the present. Apparently there are still strangers to argue with on the 'net, and "compacts" to play with instead of phones. And taking "long walks through hazardous terrain" is still a terrible cliché. Practice Run is told in visual novel format and relies heavily on the story-driven aspects. Through choices at several points in the story, you influence the unfolding of the events, and the rest is reading and enjoying. 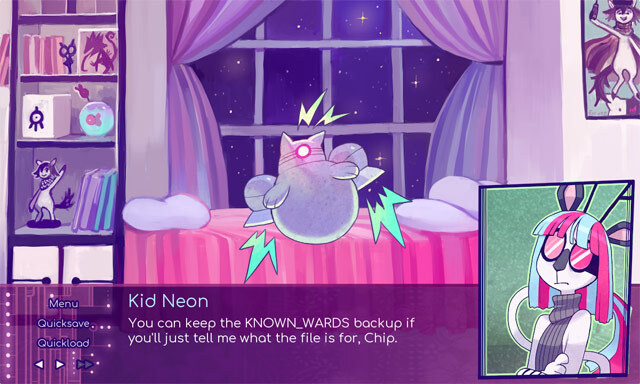 The text is set against beautiful neon-soaked illustrations showing Chip's feigned emotions as you play through the date. Several times, Practice Run will surprise you with references or inside jokes from the world of computing. At one point, when Kid Neon thinks she's ensnared Chip in a plot hole that couldn't possibly occur, Chip eagerly boops out an objection: this is a date, not a courtroom drama! Other times, Chip offers a bribe of bonus Romance Points as long as Neon promises to never take the same course of action she has just mentioned in real life. Other times when Chip is feeling less charitable, it threatens her with an electric shock. Does Chip even have an electric shock feature? Who knows, but better safe than sorry. The game is not voice acted for the most part, which is a shame - it would have been a lot of fun with good voice actors in there. The bright side is that Chip does boop or beep out the occasionally word. It's addictive to try and squeeze out another word or two out of the robot just for the satisfaction of it. To play Practice Run, simply click or hit [Space] to advance the text, and click one of the available options at points when you are prompted for a choice. There's also a series of options available from the main menu to change the flow of the text and other settings, as well as a gallery will illustrations for each of the endings, once you've unlocked them. Can you find them all, including the secret one? Practice Run takes advantage of what is becoming a popular format these days to create an interesting experience that meshes cyberpunk with contemporary. You should definitely check out this simulation full of meta-references because, as I take the liberty to unofficially quote Chip: "Beep boop bloop!" Hey! This may be inappropriate of me but if you can please support the creator with a small payment that would be swell! The author of Floraverse, the webcomic this is a part of, has been getting harassed online and off for about a year and a half now and it's reached the point where their family is being targeted and they are having to discontinue the comic that they make money with. Please go support them. Just dropping in to mention that akarroa's comment is deliberately misleading. I would recommend doing your own investigation on the matter regarding the dev of the game (GlitchedPuppet). I have loved this place for years, and I'd sorely hate for it to become a platform for child predators. ...why was my comment deleted?